Gold Vienna Philharmonic coins are recognized as one of the best bullion investments on the precious metals market. Boasting 99.99% purity and a high-liquidity value, the Austrian Mint's flagship product provides a great opportunity for investors to diversify their portfolio for a great price and with the promise of a strong return on interest make a very attractive asset. Why buy mixed years 1/2 ounce Gold Vienna Philharmonics? The reason why the Vienna Philharmonic coin is considered one of the strongest bullion products on the market is because they carry a low premium despite their low mintage volumes which make them difficult to get hold of. Mixed year half-ounce coins are therefore a prime investment and arguably a better option than the latest edition. CoinInvest cannot guarantee any gold Philharmonic coins will be available nor can we promise a precise year of issue, but if we are out of stock you can still place an order and we will notify you when more coins become available. 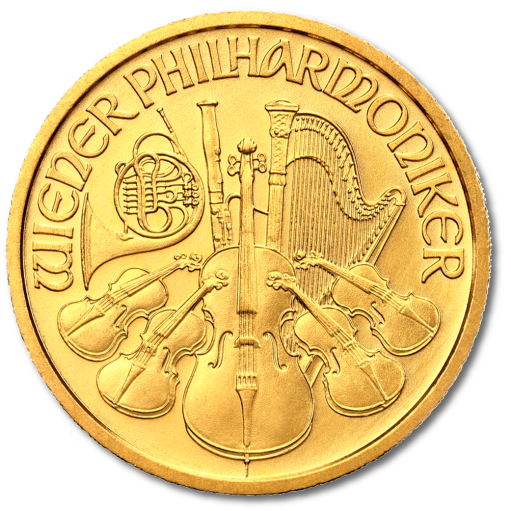 Vienna Philharmonic gold coins have a unique, award-winning design by the Austrian Mint's chief engraver, Thomas Pesendorfer. The coins portray the primary instruments most associated with Austria's prestigious Vienna Philharmonic Orchestra to whom the coin is dedicated. Dominating the obverse side is the "Great Organ" which takes pride of place in the Vienna's "Golden Hall"(Großer Saal) where the Orchestra stages the majority of its performances. Other information explains where the coins were minted - REPUBLIK OSTERREICH – that the weight is .9999 purity, the year of issue and that the coins have a face value of 50 Euros to be used as legal tender in Austria. However, in the current economic climate spot prices for gold makes the half-ounce Philharmonic much more valuable than the face value. The reverse side of the coin is the most recognizable and displays a collection of the most popular instruments that make up Vienna's Philharmonic Orchestra. There are five in all; the Vienna horn, bassoon, harp, four violins and a cello. The words WIENER PHILHARMONIKER are inscribed above the instruments. The Austrian Mint did not introduce the 1/2 oz Gold Vienna Philharmonic until 1994, some considerable time after other mints had struck denominations of their flagship coins. Even still, at that time, the Vienna Philharmonic was the only European legal tender gold coin to be produced on a large scale and at the time carried a face value of 2,000 Austrian schillings (ATS). In 2001, EU countries switched to using the Euro coin as the national currency and the Vienna Philharmonic gold bullion coin followed suit – but the Austrian Mint was the only institute to adopt the Euro for their investment products so is the only gold bullion coin that has Euro as the face value. Protecting investors against counterfeit coins is a high priority for the Vienna Mint. As one of the oldest refineries in the world, the Austrian Mint has a proud tradition of producing bullion coins to the highest standards and the detail of craftsmanship together with advanced security techniques that are impossible to replicate without being detected by experienced traders like the experts at CoinInvest GmbH. If you have any 1/2oz gold Vienna Philharmonic coins for sale, CoinInvest would love to hear from you. As leading distributors of gold bullion coins, we offer highly competitive rates for both the sale and purchase of gold bullion coins and given the limited mintage of Philharmonic coins we are always interested to hear from owners looking to cash in on their investment. If you would like to purchase a Vienna Philharmonic, CoinInvest cannot guarantee we will have the specific year you would like in stock, so feel free to enquire with a member of our friendly team. If you want to keep the year a surprise, you can purchase online by updating the number of coins you intend to purchase and clicking on the orange strip above. All you need to do them is follow the on-screen instructions to complete payment.